TD Energy Services foremost concern is the protection of the health and safety of all employees. We have adopted policies and procedures that are aimed at ensuring that TD Energy Services meets or exceeds all applicable health and safety laws and regulations as well as prevailing industry standards. We strive to fully implement all safety policies and procedures with a strong focus on prevention. This training assists employees in becoming more efficient and effective in their jobs, and contributes to a safe and productive workplace. The management and employees of TD Energy Services share the responsibility and rewards of creating a safe, healthy and productive workplace. TD Energy Services is committed to minimizing the effects of our operations on the natural environment. We endeavor to meet all regulatory and industry standards by implementing appropriate measures for the assessment of potential environmental effects, for the prevention of these potential effects and for appropriate response to any incidents that might occur. TD Energy Services Health, Safety & Environment Policies manual provides a reference for all our zemployees as well as customers and sub-contractors that we work closely with. The policies are designed to educate all employees and enable them to conduct their business in an acceptable manner, at any job site. 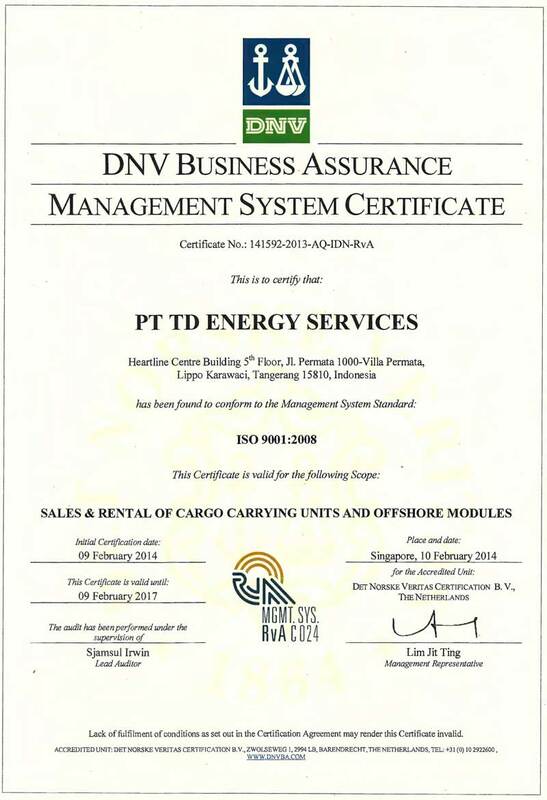 TD Energy Services Containers is an ISO 9001 : 2008 certified supplier of offshore containers. TD Energy Services provides a complete range of DNV certified CCU`s (Cargo Carrying Units) and DNV Offshore Fridge / Freezer Modules. All of TD Energy Services offshore containers are designed, tested and certified to DNV2.7-1 and EN12079 standard.